Lately our 18 month old son has been having a few sleep problems. Well I say lately loosely, as he has never to date sleep through one night! Its rather strange how my children can be so different. My 3 year old daughter is brilliant when it comes to sleeping. It was only about 6 months ago that she dropped her naps altogether and since a young age she has always slept through the night. Bedtime is 7/7.30pm and she normally wakes around 6/7am. Granted sometimes she will wake up and come into our bed, but even then she goes straight to sleep and never disturbs us. Usually we can hope for a good night which would be him waking up 2/3 times maximum but the other night my husband was working nights so I was on my own with the children he woke up at 10.30, 12.30, 2.30, (my daughter came into my bed at 3.30), 4.30, 5.30 and they were both up at 6am. I was absolutely shattered. I don’t know why he has been doing this lately and its really wearing us out. I have been toying around with certain aspects of his room lately to see whether a change in his environment would help him to sleep better. I added an extra pillow which didn’t seem to make much difference, neither did the extra blanket. I dimmed his night light which I’m sure has had some positive effects. But the main thing I did was to put up a black out blind in his room. As we are on a main road and our front door is on the pavement there can be a lot of noise from the street and it doesn’t help that we have a streetlight right outside our bedroom window either. This has made a big difference in his sleeping at night, although he still doesn’t sleep through the night he has started waking less. RoofBlindsoffer VELUX BLINDS including blackout blinds in an impressive 36 different colours. 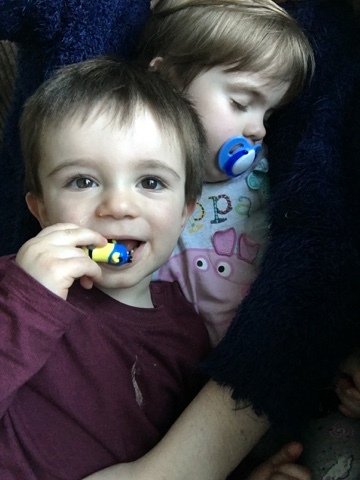 Do you have any tips on how we can help our little boy to sleep better at night? I’d really love to hear! I'd want black out blinds in the summer, but in the winter I crave light I think I need to invest in some daylight bulbs! Yes we have black out lining on girls' curtains. Both of mine were bad sleepers. Eldest has been great since about a year. Youngest still doesn't sleep through at 14 months. I had this with my youngest. His brother slept fine but he didnt. In my last house we had blackout blinds and they really did help. So much so that it's created a routine that stuck that we don't need them in our new place. I'm not sure that I can help with a solution although we are also huge fans of blackout blinds. I think that children somehow find their own rhythm, I thought my daughter would never sleep through the night but she did it when she was ready! We have always used blackout blinds since G went in his own room and found that they help loads. We also have a strict routine of bath, bottle and bed. Recently we moved G to a bed rather than a cot and found that he slept better as he didn't feel enclosed. He seems more relaxed and loves his big boys bed. Don't get me wrong, we do have nights where G wakes up and is unsettled but the transition to a bigger bed has helped tremendously. (G is 21 months old, so a bit older than your son). He also always has a muslin cloth to cwtch whilst he's going off to sleep.